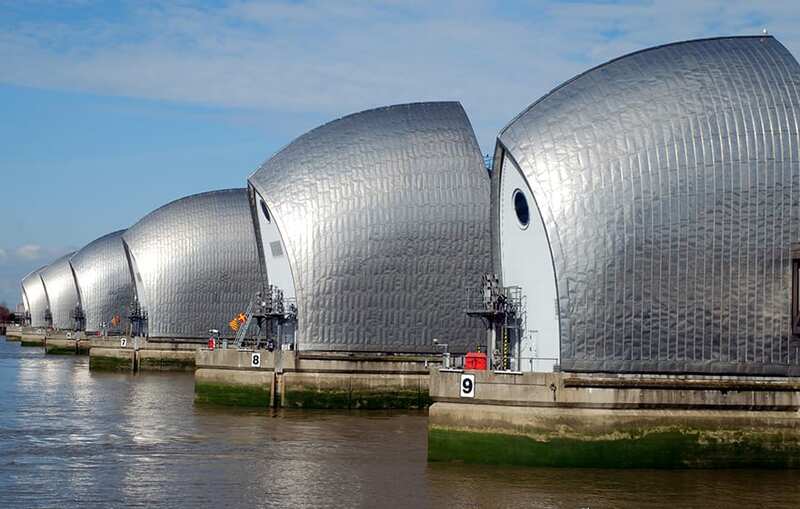 The Thames Estuary Asset Management 2100 programme (TEAM2100) is the Environment Agency’s 10-year programme to maintain, refurbish and replace tidal flood risk management structures and assets along the Thames Estuary, such as the Thames Barrier in London. It forms a key part of the Thames Estuary TE2100 Plan, which sets out measures required to protect 1.25 million people and £200bn-worth of property from increasing tidal flood risk through to the end of the century and beyond. TEAM2100 was formed in November 2014, after the Environment Agency signed a 10-year contract with CH2M to work collaboratively in an integrated delivery team. A key goal of the programme is to ensure that all asset data is managed in compliance with BIM Level 2 and output in COBie data format in compliance with BS 1192-4. This is expected to result in efficiencies in the use and re-use of information, a reduction in related overheads, and improved data transfer between suppliers and the client. Another goal for TEAM2100 is to deliver a targeted 20% cost efficiencies, when compared to 2011 baseline, and 5% efficiencies to the Environment Agency national Water and Environment Management Framework by the end of the contracted period. BIM is a key enabler to make this happen. The TEAM 2100 project partners, led by CH2M, developed a data strategy using COBie as a data schema for all major platforms housing asset centric data. These centred around GIS as a major platform around which estuary-wide data could be captured and scrutinised, Primavera P6 as the repository for schedule and cost, and a Documentation repository. All these systems comprise the Common Data Environment (CDE). As part of the process, CH2M scrutinised where its data was going to be generated and used by different software systems. Hinesh Mistry, information manager at TEAM2100, says: “We looked at the costing model and tied that in with an asset breakdown structure such that costs per task, per asset, or package of works could be defined. Photographs taken in field are geo-located and tagged to an asset, they are assigned a BS 1192 name and output alongside a COBie spreadsheet with inspections. Some 200 inspection records and 4,000 photographs, with a single generated COBie sheet, were output from the system, ready for handover. According to Alford, there was previously a lot of repeat and manual data entry, making it more onerous to update datasets in different platforms and eliminate data entry errors made by the supply chain. 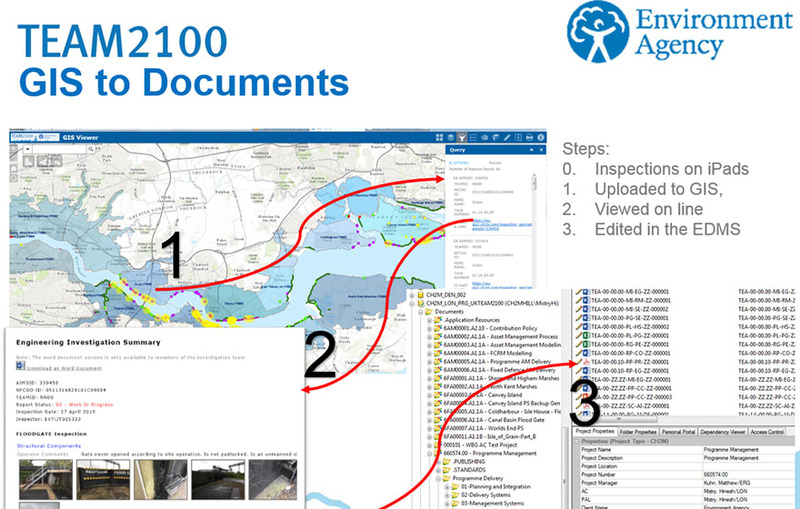 A major data reorganisation exercise saw TEAM2100 help reclassify all major flood management assets in the Environment Agency’s Asset Information Management System dataset in line with Uniclass 2015. This resulted in the production of a Uniclass 2015 “data dictionary” for all EA assets, placed into a COBie data structure, which has now been incorporated into the EA national standard applicable to all new projects. TEAM2100 also played a part in developing content for Uniclass 2015 by identifying missing objects and areas where more classification re-organisation was required. The data dictionary is expected to support wider adoption in the industry, says Alford: “As the largest group building flood defence assets, we wanted to support the wider industry through our work. By aligning our flood defence asset types to Uniclass 2015, it will be easier for others to link to them and see what structures, such as a flood defence embankment or a flood barrier, should look like. The Environment Agency is now issuing the asset data and COBie data structure, trialled on the Thames Estuary, for all of its UK projects. The TEAM2100 project is still developing its Level 2 data strategy, as it moves from a programme-wide view to inspections, design and construction at the asset level.